Nothing chocolate is safe in my house. Oh, it's safe from the kids. As much as the girls love their "CHAAWWK-let" (as they say), we can more or less control their intake because we have longer limbs and defter hiding skills than them. And it's safe from Sandy, too - she has the self control of a meditative master. That, coupled with this odd capacity to just hold on and on to snacks and whatnot until she is "fully ready to enjoy that snack" (whatever that means), results in her still having Easter candy from five years ago. How you gonna like that Peep now? So, it's me. I'm the threat. Not sure what it is, but pretty much always (and in some ways in an even more acute sense over the past few months, I've wanted chocolate. It's some kinda odd man-craving. That sounds awkward. 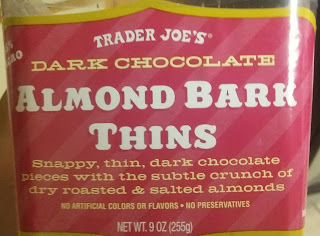 Anyways, because of this, and because we bought this right before Sandy and the kids were out for a week visiting my folks, Sandy ought to be proud of me that I didn't touch "her" Trader Joe's Dark Chocolate Almond Bark Thins once while she was gone. Once this got opened, though? She'd be less proud then for sure. Listen: it's not my fault. These bark thins aren't particularly fancy, but they make a pretty darn good little chocolate snack. Somehow we neglected to snap a pic of them, but if you ready the description on the front of the package, it explains exactly what they look like: odd sized and shaped shards of this 65% dark chocolate (tastes like the typical TJ dark choc variety) with some little teeny almond bits in here and there to add a little texture and crunch. By "thin", they absolutely are - no more than a few millimeters, to about the point wherre any thinner would call the structural integrity into question. 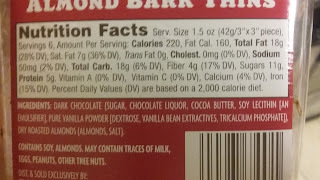 As could be reasonably expected, the dark chocolate and almonds pair well together, with the salt being a nice little touch. So nothing unexpected one way or another...except there does seem to be a little something extra. I think it's the thinness adding an extra snacky element. A regular chocolate bar would be a veritable slab requiring lots of commitment compared to a few wedges of this treat. 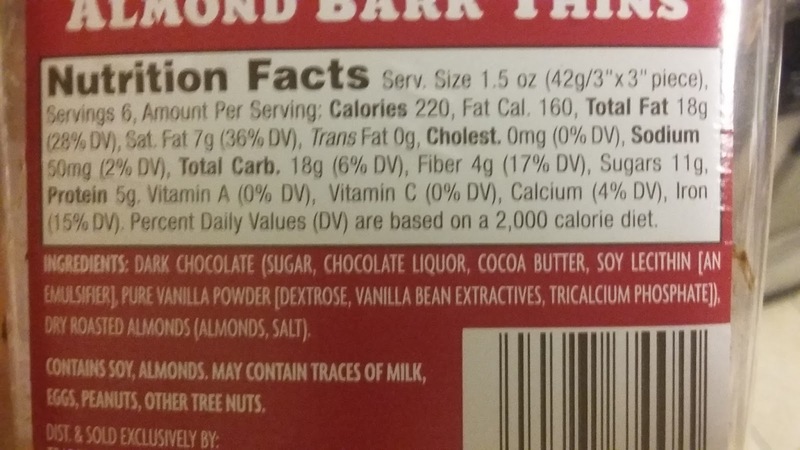 For a quick sneaky hit of chocolate here or there, a little piece or two of this bark hits the spot, more so than a Hershey kiss to me. It's a pretty good little pickup for the $4-ish it set us back. With a little control, the tub lasted us a few days of us both grabbing a piece here or there. Sandy only had to smack my hands away one or three times. As stated, nothing fancy or twisty or unexpected, but a smidge more snacktacular than anticipated. Matching fours.